Want to save an hour a day on those pesky daily reports? 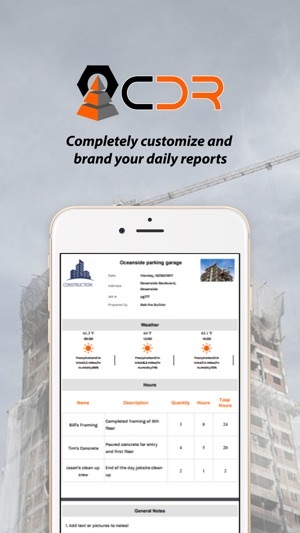 CDR - Construction Daily Reports is the fastest and easiest custom daily reporting solution for the construction industry. Customize your reports, enter your project details, then take pictures and notes through your mobile device. 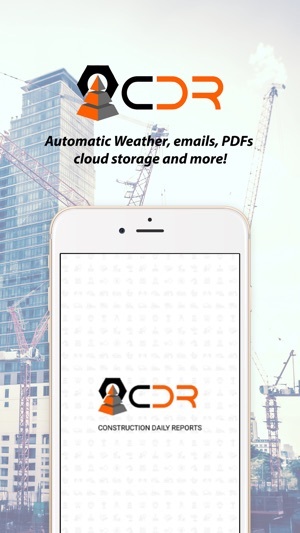 At the end of the day when you sign your finished report, CDR will automatically email your report in professional PDF format to anyone you select while saving it on our servers and uploading to your cloud storage service! 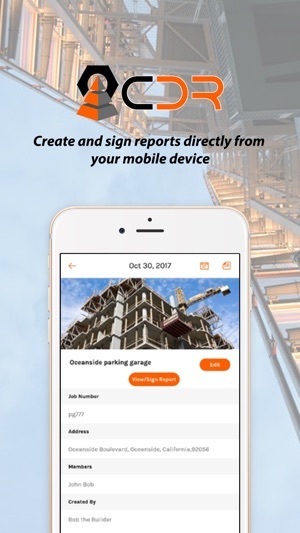 - Create hours logs, notes with text and pictures, and questions you can customize to cover areas such as safety observations, visitors, materials, and equipment. - Automatic weather capture - Detailed weather info automatically generated for each report. - Easy to Use - Simple and intuitive structure makes our app a breeze to learn and easy to master. - Mobile - Create and send reports from anywhere with your mobile device or desktop. - Save Time - Many users save over an hour every day using CDR. Our automated features make reporting easier and even faster! - Custom Reports - Every company has different needs so we addressed that. Customize and brand your daily reports. - More Accurate Reports - Capture pictures and log notes as something happens, leading to less time at the end of the day trying to remember what happened or pulling together pictures and notes. - Increase Compliance - When reports are easier to complete, they are more likely to get done! Create teams to see notes and pictures as they get added by your team in CDR. - Protect From Litigation - We keep all of your data on our secure servers for 10 years so that you can use these signed reports to protect yourself. Trust that your data is safe and easy to access on CDR. Try our 15 day free trial today! 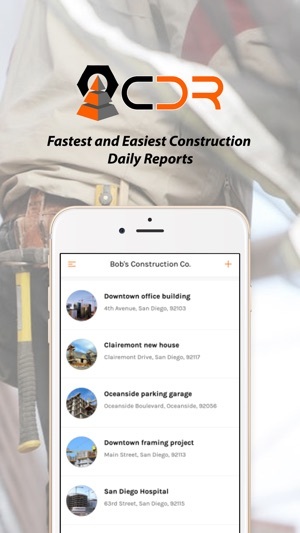 See why other superintendents, project managers, foreman, inspectors, business owners, and subcontractors are using CDR for their daily reporting needs! Email Support@constructiondailyreports.com with any questions please! Our team works hard to respond to all emails within 24 hours. Great tool! Probably one of the most simplistic apps to use and has tremendously improved our overall daily reports, both in appearance and usability. Good value and great support.